In the early 1990s, the Economic and Social Research Institute (ESRI), in collaboration with FÁS, developed an occupational employment forecasting model. In 2009, the model was transferred from the ESRI to the Skills and Labour Market Unit (SLMRU) (then based in FÁS). Since then, the Unit (now based in SOLAS) has been responsible for the maintenance and updating of the model and the production of employment projections at occupational level. This is the second occupational employment projections report produced by the SLMRU. For the purposes of this report, the original model was updated and re-estimated to facilitate the move to a new version of the Standard Occupational Classification (SOC2010) and sectoral classification (NACE Rev 2). The objective of this report is to provide an indication of how economic growth (as projected in the three ESRI Medium Term Review (MTR) 2013-2020 scenarios ) is likely to impact on employment at occupational level. By outlining alternative scenarios regarding labour market developments at occupational level to 2020, the report aims to support decision-making in the areas of education and training provision, labour market policy, immigration policy and career guidance. the shifts in the sub-sectoral, occupational and educational profile of employment within sectors, observed over the period quarter 1 2007 to quarter 1 2013, will continue over the projection period 2012-2020. While the projections presented here areuseful in assessing the direction of change and provide some indication of potential expansion demand for each scenario considered, the actual demand regarding each occupational group and each education level will depend on the magnitude of the replacement demand (arising from retirements and other exits)and up skilling requirements arising from reasons other than those captured in the model(e.g. regulation, domestic or EU policy etc.). stagnation scenario(here referred to as‘zombie EU’scenario): the EU economy stagnates(due to deflationary fiscal policy, collapse of the euro and/or a lower productivity growth than anticipated), preventing growth in the Irish economy. Occupational employment projections are developed for each of these scenarios. In addition to the ESRI scenarios,we also examine (although in lesser detail)a scenario in which employment levels in the manufacturing sector increase over the projection period, breaking a downward trend observed over the last decade and in contrast to the scenarios forecast by the ESRI.This scenario broadly follows the projections outlined in the ‘competitive manufacturing’ scenario of the Expert Group on Future Skills Needs(EGFSN)study on the Future Skills Requirements of the Manufacturing Sector to 2020 (2013). In absolute terms. 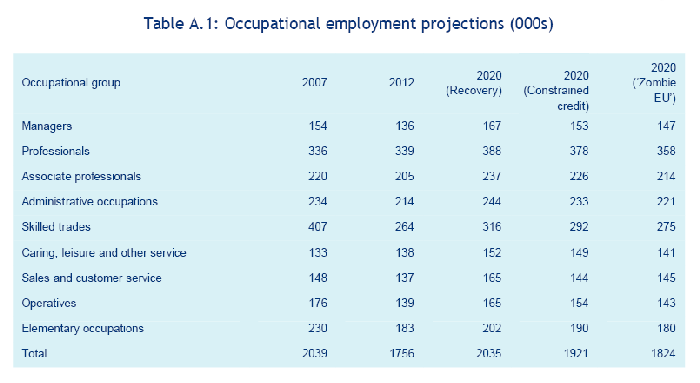 employment in all occupations is expected to increase by the year 2020 (Table A.1); the exceptions are elementary occupations for which, if the EU economy does not resume growth in the medium term, employment would be lower than in 2012; for each scenario considered, employment growth is projected to be the strongest for professional and skilled trades occupations. 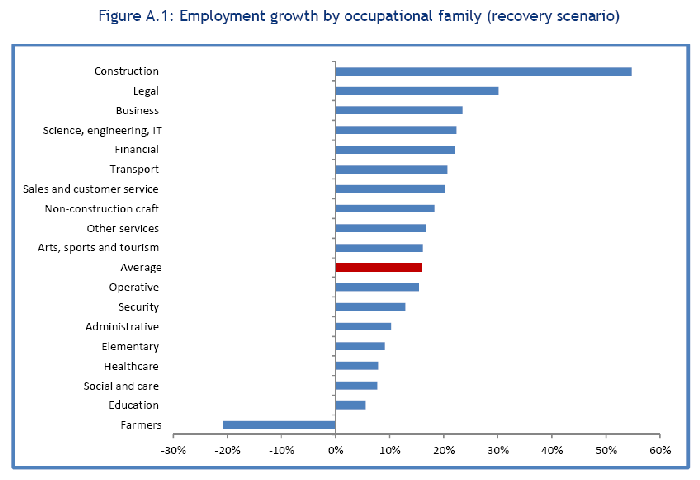 Recovery would bring strong employment growth for sales occupations (over 40,000 for all sales related occupations, including managers and associate professionals in marketing and business development); however, lack of credit or a drag in the EU exports, would reduce employment growth to a quarter of that projected for the recovery scenario. Operatives (excluding drivers) are expected to be negatively affected by the decline in manufacturing employment, but postively by the strong growth in the construction sector (construction operatives); overall, the employment change could range from no growth (weak EU) to an increase of 10,000 (recovery scenario); however, in the 'competitive manufacturing' scenario, employment growth in operative occupations is great than that projected in the recover scenario by 14,000. Employment growth in the non-construction craft occupations is projected to range between 3,000 ('zombie EU' scenario) to 22,000 (recovery scenario); however, if employment in manufacturing actually increases in line with EGFSN projections ('competitive manufacturing' scenario) numbers employed in this occupation group could be by 12,000 greater than in the recovery scenario. Slow growth is projected for education, health and social care occupations (2,500-22,000 for all three occupational groups at professional, associate professional and service levels combined, which is low given that over a quarter of a million persons are currently employed in these occupations). The number of farmers is projected to decline by 13,000 in each scenario considered. The employment projections presented here imply a change in the occupational distribution of employment between 2012-2020: an increase in the employment share is projected for skilled trade, managerial, sales and operative occupations; no change in the shares for the professionals and associate professionals and a decline in the shares for administrative, elementary and service occupations.